When Alexander was about 14 years old, his father King Phillip II decided to tutor him under the guidance of one of the biggest names in contemporary philosophical teaching: Aristotle. At that time, Aristotle had not yet made a name for himself, but he was a known pupil of Plato. So, King Phillip II invited Aristotle to impart his knowledge to his son, a decision much favored by Alexander’s mother as she had a lot of faith in Plato’s insightful apprentice. There is a famous story about the first encounter between Alexander and the famed ascetic Diogenes. Diogenes believed that man only needed the essentials to survive. So, he would sleep in a barrel, travel, and preach his thoughts to whoever would listen. Once Alexander met him in a public plaza and asked if there was anything he could do for him. Diogenes calmly replied: “Yes, you can step aside a little so as not to keep the sunshine from me.” Alexander was impressed by his blunt reply and is believed to have said to his soldiers that if he wasn’t Alexander, he would have been Diogenes. Although Alexander had a great relationship with his father during childhood, things between them had notably soured by the time Phillip decided to marry Cleopatra. 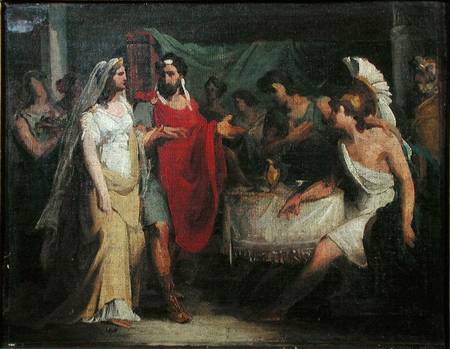 When King Phillip was stabbed to death by one of his bodyguards in 336 BC at a wedding banquet, many eyes turned to Alexander and his mother as possible suspects. But, with the throne now up for grabs, Alexander wasted no time and he was quick to eliminate all possible hurdles on his way there. King Phillip also had a son from his last wife, but Alexander had him swiftly killed by his allies. However, soon a number of rebellions rose up among the Thracians and Greeks. Alexander silenced them all with resounding authority by forcing his way into Greece and restoring Macedonian rule over all conquered states. His swift actions took everyone by surprise and soon they could do nothing but acknowledge his authority. Over a period of 13 years, Alexander pretty much changed the face of Europe and Asia, conquering all neighboring enemies and many nations beyond that. With around 43,000 infantry and 5,500 cavalry under his command, he led a fearsome military force on one of the biggest expeditions in history. During this period, he rampaged through settlements, conquered nations and empires, and founded around 70 new cities in different locations. Being Alexander, he named all of them after himself – Alexandria. All these different Alexandrias can be traced along the path of his military advances from the beginning of his expedition to its end. Perhaps the most famous among these was at the mouth of the Nile in 331 BC, and it happens to be the second largest city in present-day Egypt. Alexander founded another city at the site of his toughest battle during the campaign to conquer India: Bucephala. This was named after his favorite horse Bucephalus who died in that decisive battle. Roxane (Raxana) was the daughter of a Sogdian nobleman named Oxyartes who had the responsibility of defending a mountain fortress against an invading army led by Alexander the Great himself. Alexander was in the middle of his military campaign against the Achaemenid Empire, and the Macedonians were having to fight hard to win territory. It was obvious that they needed to achieve a truce with the native population in order to gain their trust and loyalty. Amidst all this, while Alexander was surveying captives after breaking in through the fortress, he saw Roxane for the first time. Soon they married in a traditional wedding ceremony, at the end of which Alexander sliced a loaf of bread in two with his sword and shared it with his new bride. Roxane then went with her husband on his campaigns to India in 326 BC and gave birth to Alexander’s child shortly after his death. Alexander had great presence of mind when it came to military warfare. He was a cunning tactician who would devise ways to defeat his enemies with his superior strength in terms of soldiers and weapons. Alexander inherited a well-trained army from his father, and further improved their skills. 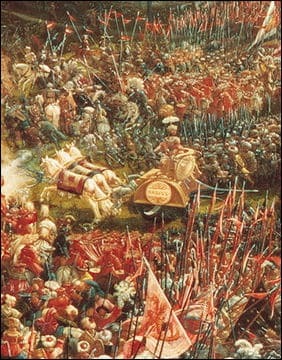 The size of his army never exceeded 50,000 at any point because Alexander valued military speed, skill, and agility far more than the number of men. Alexander is also attributed with mastering the unique Macedonian battle technique known as the phalanx. It was a formation developed by his father, but Alexander turned it into a powerful war technique. His soldiers would attack in a formation of 8 to 32 men, each of them wielding a 12- to 18-foot Cornelian wooden spear. Alexander had a formidable force at his disposal. Bucephalus was the name of a mighty horse that had cost King Phillip a fortune. But the horse’s behavior in the field was as outrageous as its price and trainers found it impossible to bring him under control. Observing the trainers’ fruitless efforts to control the horse, Alexander noticed that Bucephalus was actually afraid of his own shadow. That was when he bet his father that he could tame the horse. He calmly made Bucephalus face the sun, slowly climbed into the saddle and then triumphantly rode around on his back. Amid cheers from onlookers, legend has it that his father King Phillip took him in his arms and said: “O my son, look thee out a kingdom equal to and worthy of thyself, for Macedonia is too little for thee.” In many ways, this single incident was a symbolic glimpse of the fame Alexander would then go on to build for himself. From this point on, Bucephalus was arguably destined to become the most famous steed in history. This was an intricate knot used by Gordius, the founder of the city of Gordium, to securely tie his chariot. But far more famous was the legend foretold by an oracle which said that whoever untied the knot would go on to become the true ruler of the whole of Asia. Needless to say, countless people tried to undo it, but no one succeeded. Once Alexander had restored peace and Macedonian authority over the neighboring states, he resumed his campaign to take over the mighty Persian Empire. Alexander went on to face the far superior force of the Persian King Darius III in three monumental battles. The Macedonians won the first battle at the Granicus river in Asia Minor in the spring of 334 BC. Alexander now controlled all of Asia Minor at the loss of only 110 of his men. The two sides came to blows for the second time in the Battle of Issus. Despite the enemy’s advantage in terms of numbers, Alexander’s cunning offensives sent the Persians into retreat and Darius had to flee from the battlefield to save himself. The two then faced off in the decisive Battle of Gaugamela where around 200,000 infantry and 34,000 cavalry led by Darius went against the Macedonians. Again, the Macedonian army brought its skill and agility to good use, ensuring the defeat and inevitable fall of the Persian Empire. By the time Alexander had turned 32, he had spent most of the previous 13 years annexing much of the known world. It was in May, 323 BC when he returned to Baghdad after years of campaigning all over Asia. On May 29, whilst planning for his next conquests, he went to a dinner party thrown by one of his close confidants. After a long session of heavy drinking, he started to feel unwell and went to bed with a rising fever. His condition deteriorated over the following days as the fever took hold of his body. 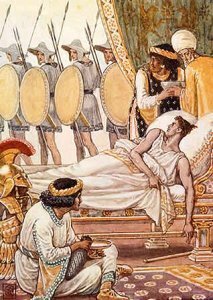 Finally, on the tenth day, with no strength to even leave his bed, one of the most famous conquerors in human history died at a very early age. Of course, his premature death brought with it a number of conspiracy theories. His general Antipater and Antipater’s son Cassander came under serious suspicion. Some even speculated that Aristotle might have had a hand in it too. However, modern medical experts attribute his death to malarial infection. Once he had become the undisputed King of Macedonia in 336 BC, Alexander faced a plethora of obstacles in the form of neighboring rebellions. Of course, he handled the situation with such commanding authority that the rebelling Thracian and Greek settlements did not think twice about accepting him as their king. And then, when he was only 22 years old, he took on the Persian Empire. 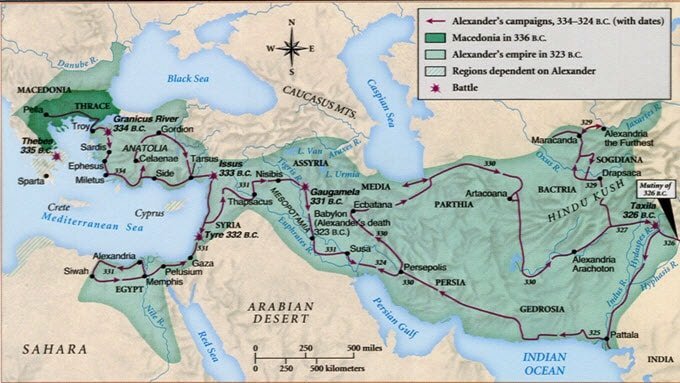 Flash forward to 323 BC, exactly 11 years later, and Alexander had traveled to places hitherto unknown and conquered much of Asia. From his first victory at the age of 18 while fighting under the command of his father, to the historical victories against the mighty Persians and many formidable Asian nations and settlements, Alexander truly made himself a legend. That he never lost a battle during his countless campaigns bears testament to his military might. By the time his army had reached the Indus on the Indian subcontinent, the Macedonians had laid down an empire that stretched from the Mediterranean to the Indian Ocean. 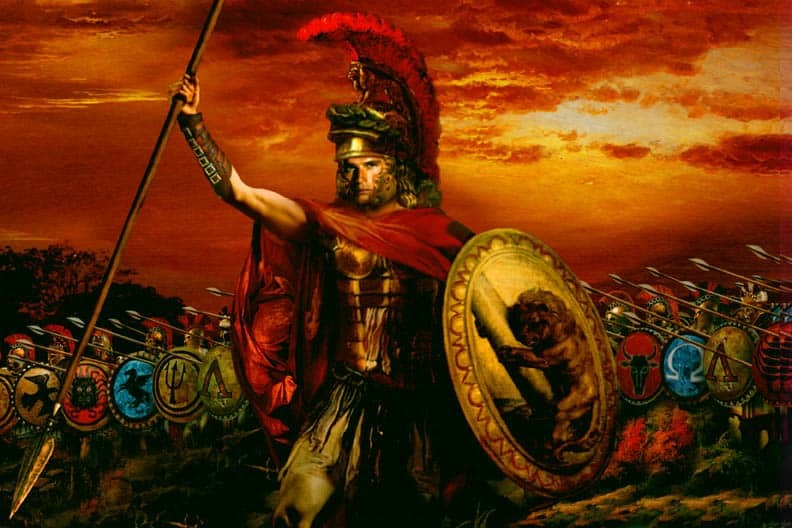 Alexander the Great’s legacy lives to this day and has had a profound effect on modern-day historians. The Macedonians saw unprecedented unification and expansion during his rule – a campaign that was started by his father and truly enacted by him. Not only did he expand his empire to the furthest known point in Asia, but he was also responsible for spreading the Greek culture to a huge part of the world. And let’s not forget, Alexander was undoubtedly one of the greatest tacticians and military minds to have ever lived. It was his tricks and training that molded an already experienced army into a skilled killing machine, and his battlefield tactics are still studied by his modern-day military counterparts. If he had live some more years, he would have changed the face of the world, specially Asia. Securing the Mediterranean (Persian Mediterranean) coast after the victory of Issus instead of chasing Darius into the interior proved a sound strategy. With the ports under Macedonian control, mainland Greece could now safely and effectively send troops, supplies and comminqu to and fro with the army (one example). But, what put Alexander over the top was his interactions with the many cultures and personalities me met along the way. He sincerely enjoyed discovering what his new people were all about. Along with his world crushing army, Alexander’s relationships and local deeds cemented a legacy in many cultures across three continents. And it manifested itself tangibly in the book(s) of the Alexander Romance. A book that was written in many different languages with stories dependent of each cultural encounter (Europe, Egypt, Iranian, Arabic). At one point it was as widely read as the Bible in parts of Europe. Alexander the Great to Iskander Gujaste (Alexander the Accurssed). Much like an adopted son too many, he is remembered to this day.